View digital images at any size with no distortion. Computer images have a fixed size. When viewed at a size other than the original, most programs show a jagged picture. 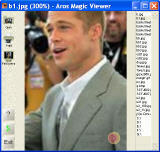 Aros Magic Viewer displays images at any size with no distortion. View a single image file or browse an entire directory. Drag and drop files from the desktop or a Web browser. Build a slide show by placing files in a single directory. It supports BMP, JPG, PNG and GIF formats. Printing an image will take a long time but it will be of the highest quality. Small size. It downloads in about a minute with a 56K modem. Fast. It loads quickly, and displays full screen images in real-time on modern machines. Beautiful. The widely praised look-and-feel is easy to use and easy on the eyes. Resolution independent. Size the window however you want, the image will scale smoothly to fit. Unicode compliant. On NT, XP and Windows 2000, file names are processed correctly in all languages. Multiple languages. The program supports many world languages. Versatile. View images obtained from the Internet or digital cameras. Share images with family and friends by putting them on a floppy disk or CD-R along with Aros Magic Viewer. Construct slide shows for business or pleasure. Drag and drop. Simply drag images from the browser or desktop and drop them on the program window (or icon) for instant magnification. This is very handy for looking at the small images typically found on the Web. Hi-fi printing. Get extra oomph from your printer. Aros Magic Viewer produces photo printouts with superior visual fidelity through intensive use of memory and processing time. JPEG, GIF and PNG. Support the most common file format used for digital photos, JPEG, and the powerful PNG used in modern Internet applications. GIF is also supported. No expiration date. You may use the trial version of this program indefinitely, as it never expires. However, registration provides numerous benefits, including online support. Very easy to use. The software doesn't need install. Directly drag and drop a photo to the software, then adjust the size of the photo by mouse. The effect of the adjustment is very good. The quality of the picture is better than the other viewers. Our screenshots display the contrast. PolyView - The high performance image viewer, printing utility, and format conversion tool for Windows.